This how to improve volleyball skills section helps you to understand how experienced coaches and volleyball players improve their game during the match. We reflect to various passing formations - helping you to get an idea how to make little changes on the court to improve your performance. Even if you are not interested in passing, we encourage you to read through these couple of pages - you can apply the same ideas into various other skills. Often in junior volleyball matches you notice players dividing the passing areas pretty equally - each player has the same size area to pass. It probably is the best practice for more equal player development, but is it the best practice to bring in results? Especially now with libero being the serve receive specialist, it gives you the opportunity to give more passing area to the libero. If we are playing for the result, not for the player development, it is beneficial to give more passing area to the libero, or any other player who is more skilled receiving the ball. It is very common to see libero taking half (50%) or even more than half of the court. Example 2: How to divide the court? If the outside hitter on the position 4 struggles with the pass - coach and other players should try to support the player and help him/her out. We use percentages to give you an idea about the areas. Libero should take 50% of the court (half of the court) and other passer for example third of the court (33%), leaving to the struggling outside hitter only a little slice (in this case 17%). That slice of 17%, feels considerably smaller compared to third of the court, s/he had earlier. That area is less than fifth of the court, which gives a passer opportunity to pass the ball directly in front of him/her, if the opposing team still serves to the struggling player. It is much easier to pass the ball when s/he does not need to move sideways or reaching the ball from the side when passing. 2) How to Improve Volleyball Skills - four primary passers, instead of three! The standard practice is to use three players to pass the ball. Have you ever thought it could be done with four passers? 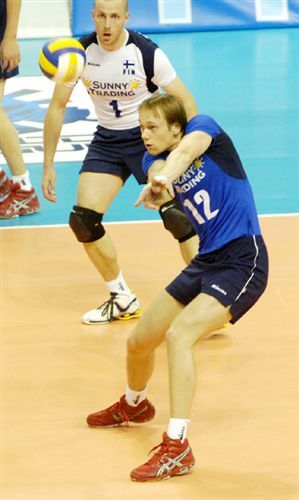 I recently watched re-run of the top international men's volleyball match, Italy vs. Russia. Russia is known for the powerful jump servers. When top server of Russia went to serve, Italy suddenly changed their passing line-up and made also their opposite to pass the ball. They had four primary players to pass the ball (only setter and middle blocker in the front row were not passing). This tactic probably makes some volleyball enthusiasts' hair stand - but why not to use it as an option - if the opposite hitter is capable of passing the ball. (In most cases, opposite hitters probably do not have the skills). Our point is - it is good to think "outside-the-box" and find creative solutions to improve your game. 3) How to Improve Volleyball Skills - dropping one passer off? Example: What about using just two passers to pass the ball against some easier serves? Older volleyball fans remember this method was in use before the jump serves became so powerful. In this era of powerful jump serves and jump floaters this method cannot be used very often in international top volleyball. However against weaker serving teams, it is still very usable tactic. Some players still serve weaker floaters or jump floaters. Why not to release one of the passers and let her focus on running extremely fast tempo attack without worrying about passing the ball first? Coach or players can prepare for this kind of changes even before the match. Every time they know weaker server is serving, they should be ready to do the switch to the passing line-up automatically.